Check the pad thickness through the caliper inspection hole and replace the pads if they are not within the specification. NOTICE: The pad retainer clip and clip can be used again provided that they have sufficient rebound, no deformation, cracks or wear, and have had all rust, dirt and foreign particles cleaned off. NOTICE: When replacing worn pads, the anti-squeal shims must be replaced together with the pad. (a) Draw out a small amount of brake fluid from the reservoir. (b) Press in the piston with a hammer handle or an equivalent. Always change the pads on one wheel at a time as there is a possibility of opposite piston fling out. If the piston is difficult to push in, loosen the bleeder plug and push in the piston while letting some brake fluid escape. (c) Install the 2 pad retainers to each caliper piston. (d) Install the anti-squeal shim to each pad. HINT: Apply disc brake grease to both sides of the anti-squeal shims ( BR-15 ). (e) Install the 2 pads. 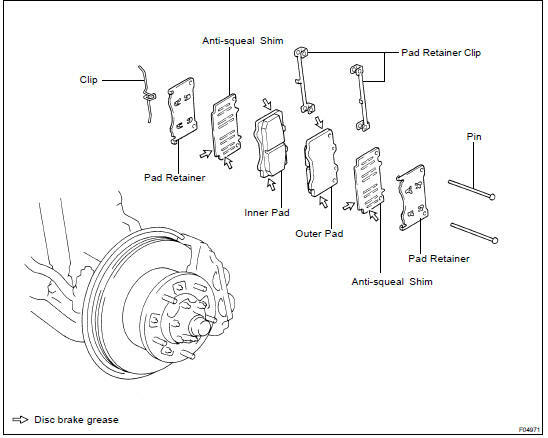 HINT: Apply disc brake grease to the pads indicated by the arrows ( BR-15 ). NOTICE: There should be no oil or grease adhering to the friction surfaces of the pads or the disc.